February 20, 2017 • Allison M. Hermann, Ph.D.
Are you living in the past or the future? Corinna Loeckenhoff, Associate Professor of Human Development at Cornell University, delves into whether our age determines where our mind may be. Dr. Loeckenhoff received her undergraduate degree from the University of Marburg, Germany and her Ph.D. from Stanford University. She completed a post-doctoral fellowship in the intramural research program of the National Institute on Aging before joining Cornell University in 2009. She was recognized as a Rising Star by the Association for Psychological Science in 2011 and received the Margret M. and Paul B. Baltes Foundation Award in Behavioral and Social Gerontology from the Gerontological Society of America in 2014. In 2013, her efforts in teaching gerontology were honored by a SUNY Chancellors Award for Teaching Excellence. Most of us would agree that when we woke up this morning, we were the same person we were yesterday, and we will still be the same person tomorrow. But what about longer time intervals? Are we still the same person we were a year ago? Will we still be the same person 10 years from now? The term self-continuity refers to our perceived connections with our past and future selves, and self-continuity declines as we move away from the present. In fact, when we’re thinking of the distant past or future, it almost feels like we’re thinking about a different person. Some recent work in our lab sheds new light on patterns of self-continuity. The study was the first to assess both past and future self-continuity and it covered time intervals from 1 month to 10 years. We found that past and future self-continuity are symmetrical: people who feel more similar to their past are more connected to their future as well. Also, most people view themselves as gradually emerging from the past and then slowly slipping away into the future without any sudden increases or drop-offs. Finally, we found that self-continuity increases with age. Younger people tend to see themselves as suspended between a distant past and an unknown future whereas older people are more likely to view themselves as part of an extended present. These findings have practical implications: Prior studies have found that people who feel less connected to their future selves are worse at financial planning and more likely to behave in ways that jeopardize their future. At the same time, feeling immersed in an extended present could lead people to resist change and turn down promising opportunities. So it turns out that who we are depends on where we have been and where we are going, and regardless of our age we should try to balance a sense of continuity with flexibility and openness for change. 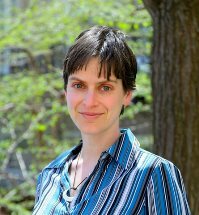 Posted in Multimedia and tagged College of Human Ecology, Corinna Loeckenhoff, Cornell University, human development, podcast, self-continuity on February 20, 2017 by Allison M. Hermann, Ph.D..